Well, yes, you could. But you’d spend 4 hours of your trip on an overcrowded train and may even struggle to return after the game. Ever bedded down on a train station bench before? It’s not the ideal way to celebrate your clubs Champions League success. Well, this simply isn’t true. Cardiff is full of exciting activities and never will this be truer than on the weekend of 2nd June. Not only is there the small matter of the world’s most watched annual club football match, but also the Champions Main Stage, situated in Roald Dahl Plass and featuring global artists & DJs. 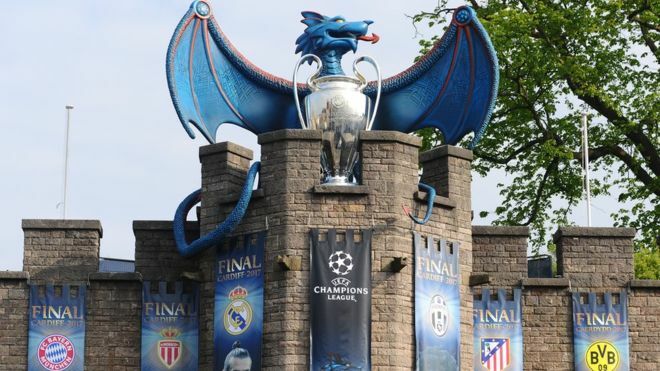 Then there is the Champions ‘Floating Pitch’, a Champions League first, which will host the highly-anticipated UEFA Ultimate Champions Match on the shores on the vibrant Cardiff Bay. We can categorically say, you will not be at a loss for things to do. This myth is just a wee bit bothersome. Not only because it is completely untrue, but also it dissuades fans from coming to Cardiff and enjoying all this great city has to offer. Camp Cardiff is THE place to stay. Fans can rock up to a pre-pitched 2-man tent for £60 per person for the night of the Final – and if they are a bit more ‘Posh than Becks’ about camping, there are VIP glamping options on offer too! Whichever option you choose, the tents are fully furnished and great value, leaving spare cash for a few beers and many burgers. How does an 18-minute walk from your bed to your seat at the Principality stadium sound? And what if that walk involved a scenic stroll alongside the River Taff, through the beautiful parkland of Pontcanna Fields? Well that is the Camp Cardiff offering. Yep, it doesn’t get more convenient than that. We’d call this more of a generalisation than an out and out lie. Yes, the weather in Wales can sometimes be unpredictable. The weather in the UK has a tendency to be a bit like that. But… the weather gods are being kind to us and we are happy to report they have predicted a balmy 17 degrees for the Champions Final weekend – and more importantly they have promised no rain. Perfect weather for camping!